I don't always agree with Focus on the Family and the things that they do, but everything that I have read from Jim Daly in the past has made me respect him as a person. I was happy to have the chance to read and review When Parenting Isn't Perfect because I was interested in hearing more of his thoughts on parenting. This is a great book for parents in all stages of the game. This is especially good for perfectionists. This book is full of stories that keep it interesting and real. 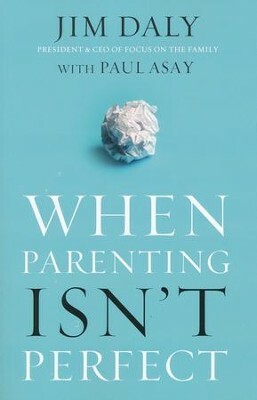 This book doesn't give a person permission to let go and stop trying in their parenting, it simply encourages them to stop trying so hard to be perfect. Jim Daly shares a lot about using grace with kids, about not expecting them to be perfect. This book helps parents know that they do not have to be perfect, and that their kids do not have to be, either. I don't agree with Jim Daly 100% in regard to all that he shares, but there is not too much that bothered me. Overall, I think that this is a good book. I give When Parenting Isn't Perfect 4 out of 5 stars.